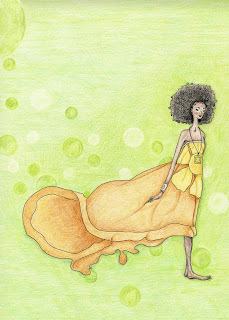 Formerly a professional dancer and choreographer for ten years, Christa Howard now creates beautiful pieces of art and illustration that are a reflection of her perceptions in inspiration, movement, line and, most importantly, a unique sense of style. 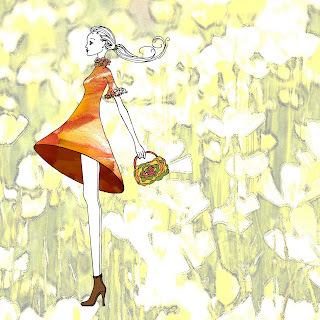 Her shop on Etsy, C Howard Designs, is filled with fresh, modern illustrations that are sweet and beautiful at the same time. Her shop caught my eye right away at first glance and made me smile as I browsed through her pieces. She even has a piece on display in her shop that is very similar to one of my favorite artworks that used to hang on my wall many years (and many moves) ago. It made my heart glow the moment I saw it as the piece I'd once owned that was so similar has long since been lost to the winds of time and whims of moving vans gone by. I'm especially fond of the style in the two pieces in this post, but she has many, many pieces sure to enchant you into a smile and stir inspiration for that special gift you've been searching for. Christa Howard's works have been chosen for exhibitions in galleries and selected as "best in show" at Chapman University in Orange, California. Her photographs have also been used on websites, been commissioned for businesses and been customized for weddings and special events. 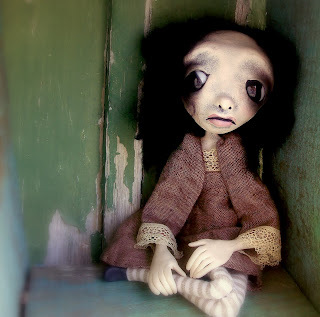 She's incredibly talented and her work is absolutely lovely. Her shop is a pure joy so be sure to stop by and take a wander through the gallery of her work on Etsy! TO VISIT CHRISTA HOWARD'S SHOP ON ETSY, YOU CAN CLICK THE PICTURES ABOVE OR, IF YOU'D RATHER, CLICK RIGHT HERE! Today's shop instantly made me feel a feeling that I haven't felt in what seems like ages. And, I mean... ages. When you were little did you ever see something in a store or in your neighbor's yard or on the playground that just instantly made your soul do a little jig and burst forth with an "Oh oH OH! I wanna play!!" reaction? That's what I experienced the day I saw today's shop. How many people actually get to enjoy that feeling as an adult in such a basic and pure reaction? It was refreshing and enjoyable. Amazing even.... and so I have to share Moozlehome with you too. 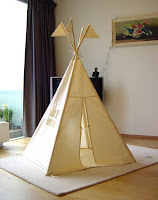 Moozlehome by Kate Clarkson and Dennis Harrison has the most amazing indoor play tents and tepees for kids, you see. Not just are the designs the cutest I've seen so far as well as clean and fresh, but they're designed for play and decoration both! 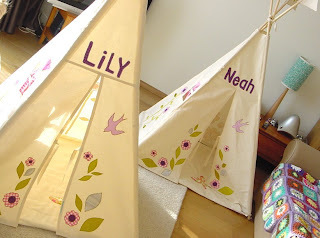 They can even be personalized with a child's name! I absolutely love these tents. I love the pictures too! So much fun and so pretty too. Moozlehome also has some of the most beautiful baby blankets that I've ever seen. Really beautifully done workmanship. YOU CAN CLICK ON THE PICTURES ABOVE TO VISIT MOOZLEHOME ON ETSY AND TAKE A LOOK AROUND OR, IF YOU PREFER, CLICK RIGHT HERE. I have to admit, I've never really understood the whole piercing spacer style. You know, where someone pierces their ears then gradually makes that hole larger and larger? I've actually seen a few that made my stomach turn. That said? I came across a shop the other day that gave me a whole new perspective on this style of piercing. Usually, you see spacers inserted that aren't particularly decorative. Sometimes they're hollow and just a ring so you can see all the way through. Many look like plugs. Either plain plugs or with something like a gem tucked in them. At Pearce Dunlap, though, you can find spacers that are tiny, unique pieces of art. 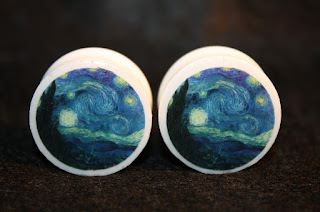 I think if I'd seen more people with such pretty and ultimately intriguing pieces in their ears, I might have been given a completely different first impression of this style of piercing because, I have to admit, I find these plugs very, very intriguing. Pearce Dunlap has everything from Van Gogh reproductions in miniature on their plugs to cogs and wheels for those with a sense of Steampunk style. Happy faces, Coca Cola, Converse and Darth Vader sit along side with Pokemon, Steampunk gears, clock faces and much more! They even do made-to-order so you can custom order what you want. 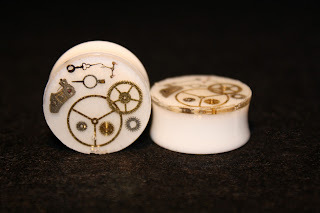 So, if you're looking for a little variety and intrigue in your plugs and gauges, you really need to stop by and take a peek. It might give you a new perspective on this style of jewelry, too, if you were one of those (like myself) that had been carrying around a somewhat negative first impression! TO VISIT PEARCEDUNLAP ON ETSY, YOU CAN CLICK THE PICTURES ABOVE OR, IF YOU'D RATHER, CLICK RIGHT HERE! Whew!! Blogger/Blogspot malfunction is now under control and we're back to your regularly scheduled program! I have a friend who would love this pin. 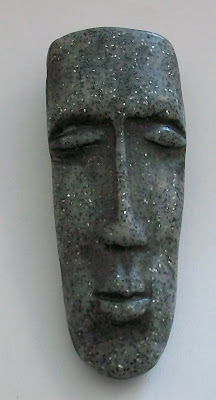 She has a thing for masks, and she's often expressed a fascination with the Easter Island statues that this little brooch pin is made to resemble. The pin is from the shop of one of my BESTeam Etsy Team members, Cassandra from Ardna's Sac Etsy shop. Her shop contains a collection of polymer clay tidbits like this pin and other creative works along with a bit of jewelry, some button art and other tidbits. Cassandra is an old-hand when it comes to polymer clay work and her initial experiences pre-date the "New Clay" by Nan Roche. Her selection in her shop is currently a bit small but I look forward to seeing what else she comes up with and look forward to following her shop's progress. She's a member of the Polymer Clay Artist Guild of Etsy as well as a few other teams as well as a member of the New York Polymer Clay Guild. YOU CAN CLICK ON THE PICTURE ABOVE TO VISIT ARDNA'S SAC ON ETSY AND TAKE A LOOK AROUND OR, IF YOU PREFER, CLICK RIGHT HERE.